North America is entering a new phase. Energy abundance is becoming a reality, and awareness is growing that this will fundamentally change geopolitics to North America’s benefit. Meanwhile, Mexico is implementing reforms across a range of sectors, moving towards greater competition. The United States has noticed and, for a confluence of reasons, is investing massively in the bilateral relationship. These dynamics also enhance Canada’s incentives to support regional cooperation. Altogether, it is time to take a fresh look at North America. Coincidentally, North America’s two most prominent institutions have reached inflexion points. The North American Free Trade Agreement (NAFTA) is 20 years old. It has made North America into the world’s most productive region, but the increased trade and investment it ushered has plateaued. Most of its original structures have become inactive over the years. It remains a cornerstone of the region’s economy, but it is no longer a driver of positive change. Indeed, the three countries have tried other tools to deepen competitiveness. Recent bilateral mechanisms tackle some of the “soft” obstacles to productivity that NAFTA failed to address. They include Beyond the Border between the United States and Canada, the Twenty-first Century Border Initiative with Mexico, and regulatory alignment mechanisms between the United States and its two neighbors. However, none of these has succeeded in becoming the new workhorse for competitiveness. Since negotiating a revamped North American FTA is not in the cards, the three countries have pinned their hope on the Trans-Pacific Partnership to update trade rules within the region. North America’s other key institution, the North American Leaders Summit (NALS), is opening a new chapter marked by rekindled interest in all three capitals. The joint leaders’ statement of the February 2014 Summit in Toluca reads like a cogent text rather than a negotiated document: an unusual quality for a multilateral text, which signals clarity of purpose and a high degree of convergence between the three governments. The rationale for North American regionalism is compelling, couched in shared prosperity and security. The declaration proposes real action (harmonized trusted travelers programs, a rail transportation plan) and highlights new opportunities, such as energy. It also brings policy down to the level of citizens, touching on education and mobility. It concludes with Canada’s offer to host the NALS in 2015. This is an excellent basis. It contrasts with a decade of North American Leaders Summits marked by pitfalls that all three governments will now want to avoid. From 2005 to 2009, the Security and Prosperity Partnership supported the Summit, but became a frustratingly cumbersome trilateral undertaking, maligned in public opinion and ultimately abandoned. The pendulum effect led to a period of abeyance, missed Summits, declarations with little follow-up, and further reliance on bilateral mechanisms to get things done. The region had to wait for Mexico to host again, in Toluca, to reaffirm the importance of North America and the NALS. The three countries should use the next three-year cycle of NALS to take regional cooperation to a new level. Between the energy revolution, developments in Mexico, the possibility of the TPP, and renewed interest in all three countries, the opportunity is real. It must be seized through prosaic action at all levels. North America is a small club, even by small club standards. With only three national players at the table, the agenda tends to avoid contentious topics in favor of consensual items. No NALS ever centered on international migration, the rule of law, or energy infrastructure—yet those are clear priorities for individual countries that require a regional response. For the region to productively tackle its challenges, leaders must agree to work on each other’s priorities. This is best done in a coordinated fashion. 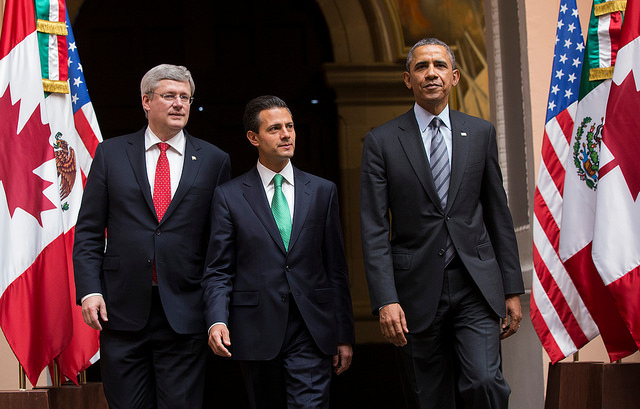 As a first step, leaders should agree on a common agenda for the coming three-year cycle of NALS: Canada in 2015, the U.S. in 2016, back to Mexico in 2017. This would create a common roadmap, afford each country time to deliver its part, and reflect the interdependent reality of North America. Below is a proposed division of labor that speaks to each country’s circumstances and how it could brand its next NALS chairmanship by focusing on specific themes. Each country has a slightly different case for North America. Sustaining solid economic fundamentals has long been a Canadian priority, from public finance, to banking, to free trade agreements, to a highly welcoming business environment. Regionally, Canada wants the North American production platform to remain globally competitive and integrated. Canada also needs to ensure that the U.S.-Mexico honeymoon does not negatively impact its own bilateral relationships. For these reasons, Canada should champion competitiveness and strengthen the NALS as an institution that can deliver. Both are important technocratic challenges that befit the strength of the Canadian public service. In today’s environment, achieving greater competitiveness means reducing governments’ disruption of economic activity at the juncture of the state, while duly protecting citizens. Facilitating the legitimate flows of goods and people across each border and harmonizing regulations across jurisdictions both fall in this category. The initiatives underway in these sectors must be pursued vigorously, facilitated by expert administrative guidance and regular lubrication, through the expression of political will. North American competitiveness also demands new investment in infrastructure, especially at the borders, which may require new financing models given government austerity. Canada could join discussions on the future of the North American Development Bank (NADB), which Mexico and the United States intend to launch to collectively renew its mandate. Third, Canada should lead the effort to revisit the numerous structures of NAFTA that have ground to a halt—many of which continue to have relevant objectives—and explore how to revitalize a select few. As semi-independent bodies, the Labour and Environmental Commissions could be given research mandates to support discussion of key North American issues in their respective spheres, and lay the basis for a regional approach. For example, a study of future labor market trends and needs could inform competitiveness and mobility policies. Governments also need to consolidate the NALS into a more consequential meeting. An annual declaration is a blunt and inadequate instrument to direct three large bureaucracies. The Toluca declaration recognizes the need to create a follow-up process, based around a senior official in each country and reports to leaders. This ought to be implemented quickly and thoroughly. Other international groupings provide examples and inspiration into what the NALS process could be. The G7 in particular benefits from a well-established sherpa process. Sherpas are individuals directly vested by leaders to prepare Summits and ensure follow-up, with the support of a small dedicated team in their country. They meet throughout the year, under the chairmanship of the host country’s sherpa, setting the stage for the leaders’ discussion. This has proven effective to move bureaucracies, and remains far more nimble than a permanent secretariat. Another noteworthy feature of international summitry is how ministerial meetings flow to and fro the leader's meeting, each bringing a part of the common agenda to the Summit and then implementing decisions. There is a growing tendency for line departments to meet trilaterally in North America, starting with the traditional sectors (foreign affairs, commerce) and branching out to energy, environment, defense, etc. Harnessing these meetings towards the NALS would magnify their impact. The United States is flanked by its top trading partners, both of which contribute to its productivity. It underwrites a large part of regional security and, in return, reaps a healthy share of economic gains by virtue of being the largest economy. Its foreign policy is also a key determinant of Canadian and Mexican foreign policies—both countries are inevitably compared to the United States in all they do internationally. As the region’s de facto leader, the United States should steer the most fundamental change affecting North America: energy abundance. It should champion regional energy integration, explore opportunities for foreign policy convergence, and provide environmental stewardship. Energy abundance will have profound impacts for the region. For starters, the United States will switch from being a net energy importer to an exporter, subtly changing its relationship with Canada, its largest energy supplier. Mexico will also compete with Canada for access to U.S. refineries, and in the short run continue to purchase U.S. natural gas. Given the market principles that govern Canadian, American—and increasingly, Mexican—energy sectors, regional integration will ultimately be decided by the private sector, but it should be informed by a discussion with all three leaders. That discussion requires the convening power of the White House. Examining energy would pave the way for a discussion of geopolitics, and possible coordination in international affairs. Embracing the potential of a North American caucus on the global stage, leaders could decide to routinely touch base before key international events, as the United States does with several of its strategic partners. Nowhere is the interdependence of the three countries more obvious, and more accepted, than on economic issues: trade negotiations, global finance, energy, and the environment. These should be the natural starting point for coordination. Observers expect the shale gas revolution to have global consequences, redrawing the map of haves and have-nots power beyond the U.S.-Middle East axis. North America is also faced with a challenge at its doorstep, which leaders acknowledged in Toluca, and that is the vulnerability of Caribbean and Central American countries to energy shocks. North America is now in a privileged position to address this issue, and should do so. A focus on the environment and green growth would complement a summit based around energy. It would address a real issue and support the Obama administration’s “green legacy.” Given declining hydrocarbon prices, one would expect regional energy consumption to increase in the next decade, driven by energy-intensive industries. Greater extraction will also lead to more GHG emissions, and challenge the viability of green technology. As a responsible global actor, North America needs to mitigate these negative trends by championing energy efficiency, renewable energy generation, as well as limiting carbon emissions. Mexico has done North America a favor by hosting key Summits in 2009 (Guadalajara) and 2014 (Toluca). Its own relationship with North America is, however, complicated by its twin regional memberships. Mexicans have sprawling ties that reach deep into the fabric of the U.S. population and simultaneously into Latin America. As a result, Mexico is uniquely positioned to champion mobility and people-to-people connections in the region. It could also pioneer a more inclusive approach to North American regionalism. Mexico has long been an advocate for the right of migrants, and addressing migration issues, including illegal migration and the situation of unaccompanied minors, would certainly be to the region’s benefit. North America also needs to facilitate the legitimate movement of people—not just at the border, but in the economic sphere as well. Visa requirements, temporary workers, and credentials recognition are important steps to consider in addition to harmonizing trusted travelers programs. These are sensitive issues, not least because their upsides are diffuse: better access to human capital, a transnational workforce and, over the long run, more profound international networks. Contrary to other summits, such as the BRICs, the G7, and others, the NALS has not served as a platform to build or cement bridges (other than among the three leaders). This offers scope for strategic thinking. There are at least two different ways in which the NALS could be used: to affirm North America in the world, or to support networks that make North America a multifaceted region. In classic summitry fashion, the NALS could be used to explore or bolster partnerships that extend beyond North America. Representatives from the Pacific Rim or from European countries could be invited, to reflect the evolution of current trade negotiations. The NALS could also reach south into the Western Hemisphere, either to discuss its broader neighborhood—meeting with countries of the Caribbean and Central America—or with key economic partners, such as the members of the Pacific Alliance. Another way of broadening the NALS would be to reach within North America and bring other constituencies to the table. So far, North America has been mainly about national governments and big business, as reflected by the relative prominence of NAFTA and the NALS. But other constituencies have emerged as important. Metropolitan cities in all three countries are first-tier international actors with a direct stake in the success and vitality of North America, who would bring valuable perspectives to leaders’ discussions. Current cross-border gatherings of states also reflect subregions that exist culturally and are maturing politically: the Pacific Northwest, Eastern Canada and New England, the U.S. Southwest and Northern Mexico. Representatives from these regions could also be invited. Outreach and inreach would bring different benefits, but they are not mutually exclusive. Inreach leads to deeper regional connections, can address “intermestic” issues, and yields legitimacy for those sub-national actors who carry the North American brand. Outreach translates into greater global presence, can address foreign policy issues, and brings a sense of unity. Leaders will chose when and how to use those tools. Whatever the format, a valuable byproduct of this type of engagement would be to break the awkward geometry of a three-member summit. If benign neglect remains the common approach, as it has been over the last few years, North America will miss several opportunities in the decade ahead. Competitiveness will deepen slightly owing to U.S. bilateral processes with Canada and Mexico on border and regulatory alignment. NAFTA will not change significantly. The NALS will continue to shape a minimal common agenda, producing mostly aspirational statements. The United States will continue to strategically choose which neighbor to engage first on any given issue. Border infrastructure will continue to age. We will become energy exporters without maximizing the associated leverage. North America can do better. By agreeing on a multi-year agenda, leaders can create a solid basis to advance a number of mutually beneficial issues, and navigate political transitions in the United States (2016-2017) and possibly in Canada (2015). The agenda sketched in this paper is not predicated on a grand regional project, but on pragmatically advancing issues of regional consequence. It would require hard lifts in every capital, but those would be counterbalanced by visible gains for all three countries. With a vibrant and untapped constituency, looming energy abundance, and sound economic fundamentals in all three countries, this can be North America’s moment. Christian Ranger is a career Canadian diplomat specialized in the Western Hemisphere. The views expressed here are the author's own. 1. The first two are bilateral processes between Canada-U.S. and Mexico-U.S. that aim to expedite the legitimate flow of goods and people across the border while addressing threats. Regulatory alignment refers to the process of eliminating unnecessary regulatory differences between jurisdictions, in this case Canada-U.S. and Mexico-U.S.
2. An agreement between Europe and North America could serve a similar purpose, but the current Transatlantic Trade and Investment Partnership (TTIP) is a negotiation between the European Union and the United States, to which Canada and Mexico are not parties. 3. Canada did not host leaders in 2010, and the U.S. postponed the 2011 meeting to 2012.